Here at NordicTrack, we always strive to make fitness more accessible – creating high-quality exercise equipment and being priced affordably for all. And to take things a step further, we have created an incredible, innovative program to put your health and fitness goals closer within your reach – the fitness tracking program called iFit®. This program allows you to have access to renowned personal trainers, workouts, sleep analysis, and nutritional advice every single day. While a NordicTrack treadmill can improve any running workout thanks to features like the cushioning on the deck intended to reduce the impact on your legs, working out with an iFit® personal trainer can elevate your treadmill workouts in several other ways. Stunning visuals to help immerse you into your workouts. Many of the treadmill workouts on iFit® featuring a personal trainer were filmed in gorgeous and iconic areas like Goblin Valley or along the scenic streets of Paris, France. The personal trainer will virtually run with you through these areas, so you can enjoy a run with an encouraging personal trainer while enjoying the sights of faraway places. iFit® can push you further. Another exciting innovation that comes with iFit® is that your personal trainer will control your treadmill’s speed and incline. That way, the personal trainer will be able to push you to progress further than you thought possible. You can also adjust the speed and incline if you do find it too much at any time, then rejoin the personal trainer’s settings when you feel ready. Enjoy a large selection for every workout mood. 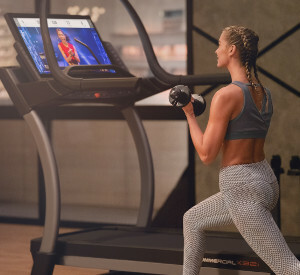 We understand that people may need their treadmill workouts for a variety of reasons, so iFit® has been designed to reflect the many uses of a treadmill. You can choose from a variety of programs, from challenging runs to full-body HIIT workouts and even walking tours. There are also cross-training programs available, so you can carefully hop off your treadmill and do some lifting or yoga to round out your workout. After the first year of the included membership with the purchase of your treadmill, you can opt out of paying for the iFit® personal training program, but we’re pretty sure that once you try it, you are going to love the personal trainers and love conquering your goals. Any iFit® enabled exercise equipment, which most of our fitness equipment is able to provide. From your device, so you can download the iFit® app and track your sleep, nutritional intake, and schedule out your workouts. So, if you are ready to conquer your health and fitness goals, make sure you have a NordicTrack treadmill with iFit® personal trainers to support you to the finish line. DISCLAIMER: This post is not intended to replace the advice of a medical professional. The above information should not be used to diagnose, treat, or prevent any disease or medical condition. Please consult your doctor before making any changes to your diet, sleep methods, daily activity, or fitness routine. NordicTrack assumes no responsibility for any personal injury or damage sustained by any recommendations, opinions, or advice given in this article.